With most of their students coming from outside Montgomery, the Chelsea School will leave Downtown Silver Spring in 2012 and has sold their property on Pershing Drive to a local developer planning to build up to seventy-five new homes there. The Chelsea School's five-acre campus in Downtown Silver Spring. The intersection of Ellsworth Drive and Cedar Street is at the top left corner. Image from Bing Maps. Representatives from the private, special-needs school met with neighbors at a meeting of the adjacent Seven Oaks-Evanswood Civic Association last week, according to minutes provided to us by the organization's secretary. The Chelsea School explained that all but one of their ninety students commutes from Prince George's County or the District of Columbia, whose school districts pay for their education there. Just two years ago, the school launched a massive capital campaign to build a library designed by starchitect Daniel Libeskind, but the economic downturn has forced them to close entirely. Instead, they'll teach from within public schools closer to where their students live. 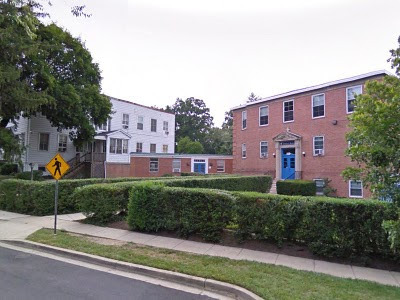 As a result, the Chelsea School sold their five-acre campus near Pershing Drive and Cedar Street to Bethesda-based EYA. 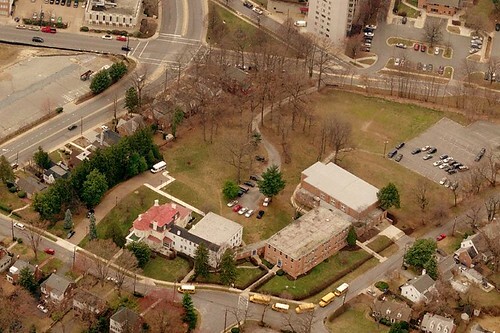 The developer's reputation for quality urban redevelopment projects in Silver Spring and throughout greater Washington was a factor in the school's decision to sell to them. These school buildings along Pershing Drive would be demolished to make room for new housing. Image from Google StreetView. Representatives from EYA were also there to discuss their initial ideas about the project. They'd like to see a mix of seventy-five single-family homes and townhomes on the Chelsea School property, which is more than the current zoning would allow. The site presents multiple challenges to designers, including steep slopes, a stand of trees close to Ellsworth Drive, and a number of existing buildings, most of which would likely be demolished, they explained. However, EYA would preserve the historic Riggs-Thompson House (PDF!) on Pershing Drive, which dates to 1858 and is currently used by the school. The Silver Spring Historical Society would like to see the house restored and used in "some public capacity," says president Jerry McCoy. "It is the society's hope that any project plan for the Chelsea School property will include . . . plenty of green "breathing" space around the property to 'approximate' its historical setting," he wrote in an e-mail to JUTP. 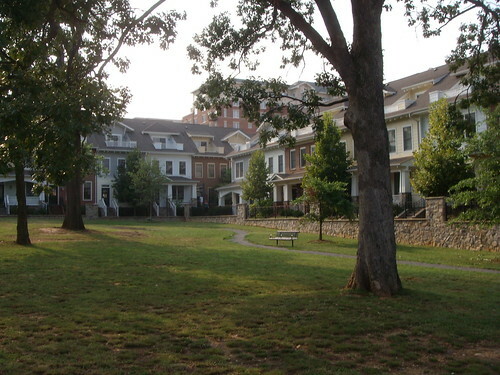 The developers compared their ideas for the Chelsea School site to projects they've built nearby, including the Cameron Hill townhouses at Colesville Road and Second Avenue, the Brownstones at Wheaton Metro, and the ongoing redevelopment of the National Park Seminary on Linden Lane. Each of their communities feature homes unique to that project, they explained, and anything built here would be designed specifically to fit with that neighborhood. Clarendon Park, an EYA development in Arlington. LEFT: A house in Clarendon Park. Another precedent EYA mentioned was Clarendon Park, a townhouse development near the Clarendon Metro station in Arlington. Like the Chelsea School site, Clarendon Park serves as a transition between a business district and a neighborhood of single-family homes. 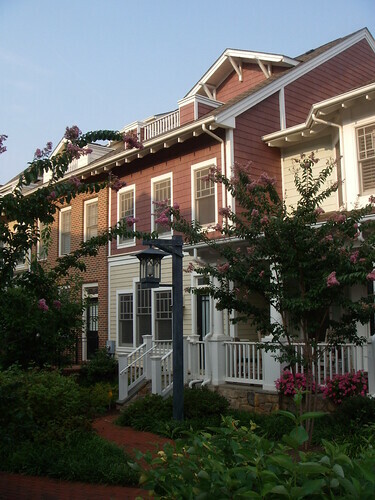 Here, Craftsman-style rowhouses sit behind a large mixed-use complex called the Market Common, with a large park sitting between them and existing homes. Nonetheless, residents had concerns about the amount of traffic the new homes could create, and if existing trees on the property could be saved. EYA was unclear about whether they could save any trees on site, but they suggested that some open space could be set aside along Ellsworth opposite the current Silver Spring Library. Some, however, are curious about the possibilities. "Five acres right next to [Downtown Silver Spring] should be used for higher density," says Liz Brent, who lives one block away from the school. As a real estate agent, she's familiar with EYA's work throughout the area. "We'd be lucky to have them, in my opinion," she adds. Under current plans, the Chelsea School will stay in Silver Spring through the spring of 2012. Meanwhile, EYA will design the new project with community input and submit it to the Planning Department for approval, which will require re-zoning the property for townhouses. Construction could start as early as summer 2012 and finish within two years. thanks for the update. Amazing how fast things can change. I can't imagine how much hand wringing this will cause! The Chelsea School Board of Governors has spent the past year and a half working on the sale of the Chelsea School campus in Silver Spring, Maryland. We are happy to announce that we have signed a letter-of-agreement with the EYA Development Corporation for the sale of our property. We will not be leaving this property for at least twenty-seven months and are scheduled to depart Silver Spring in August of 2012. There are specific benchmarks that need to be met before closing this campus. If timelines are adjusted or any other disruption occurs which interferes with the sale of the school, we will inform the community immediately. It is our goal to make this process as transparent as possible and to involve our parents and staff in important committee work as it unfolds over the next twenty-seven months. We see the sale of our school property as very positive; it allows us to grow our program and it ensures long-term financial stability. The decision not to build a permanent home in Silver Spring was based on strong enrollment trends. It is financially beneficial to work closely with the two jurisdictions that fund the majority of our students: Prince George’s County and the District of Columbia. To this end, we are looking at both of these geographic areas to be our new home, with our long-term goal to be in both locations. It is important to note that we will continue to welcome and recruit private-pay families and students funded by all school systems. We will continue provide a superior program model that meets the needs of students with language-based learning challenges. The integrity of our program model is paramount and will be the guiding force behind all decisions for the future. While we are eventually moving to a new location, we will not change who we are and what you have come to know and love about our organization. We appreciate your continued kind words and unwavering support..